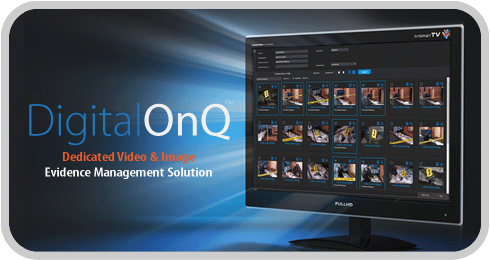 A fully dedicated video and image evidence management solution. Our solution streamlines and enhances an organization’s ability to import, store, view and manage digital evidence from body worn cameras and any electronic source. Providing users an complete and secure solution to manage and view all their digital evidence in one place. If you currently are managing/storing images on CD or DVD or even on a local or remote hard drive, or if you are looking to implement or are needing a total solution for your body-worn camera data, then DigitalOnQ is the perfect solution. It can eliminate the liability and time associated with storing files on physical disks, prevent and track photo tampering and editing, allow you to quickly see all meta data, all while being fully integrated with evidenceOnQ and more. This fully SWGIT compliant solution allows you quickly view hundreds, even thousands of media files quickly, select the ones you need to review or share for trial preparation and more. Easy to use search tools allow you to query digital evidence by name, case number, type, date, photographer, any metadata field and more. Stop spending hours combing through CDs and DVDs searching for something. Now you can dynamically view all images [and video, or a single video] related to a case, in a detailed thumbnail view with simple one-click preview access. DigitalOnQ verifies that imported images came from their original source and discovers duplicate files that may already be in the system. All images are imported with their original Metadata created at the moment the image was captured, such as camera make/model, date/time taken, camera settings, image size, GPS location, and more. Maintain full image integrity throughout its entire evidence lifespan. No matter how or where your digital media resides – CDs, flash drives, external hard drives, servers, or others sources – we provide you the flexibility to easily import large volumes of archival, current and future media data into the system. DigitalOnQ allows you to group or associate your evidence into categories that fit your processes. Quickly and easily select images of video to be burned to DVD/CD with a few clicks. DigitalOnQ makes sure no copy of images are left on local hard drive, and verifies that the burned media guaranteed working copy. Store all your evidence in one place. Investigators, prosecutors and others can view both physical evidence records and digital media evidence from one platform. There’s no need to utilize two systems, or to request CDs or DVDs to review videos or images related to a case. One-click access to the DigitalOnQ repository provides a complete evidence solution. Significantly reduce the labor and material costs associated with outdated methods of managing your digital evidence...downloading from memory cards; burning to expensive and trouble-prone CDs and DVDs; packaging, booking and storing discs as physical evidence; and later making copy discs just to permit viewing. Gain significant savings in staff-hours that can pay for the system and more within the first year. DigitalOnQ provides a 100% SWGIT compliant and secure repository for all images, video and other forms of digital evidence. Image authentication processes are built-in, so original images are always preserved and are tamper-proof. Enhancement tracking shows any edits, processing modifications, or movements made to any media type.